The official TBDBITL Alumni Band uniform is red shirt, grey pants/slacks, black shoes/socks/belt, and red ballcap. 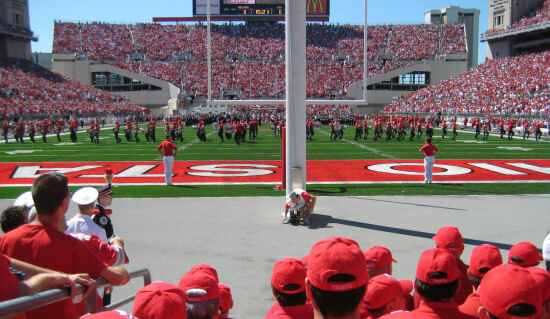 The red ballcap was introduced in 2006, and is the required headgear for the the TBDBITL Reunion Band. Shirts, Caps, and optional Jackets may be ordered directly from Oasis Embroidery using the order form below. To avoid shipping charges, you may stop by Oasis Embroidery to pick-up your apparel. Office hours are M-F 9-5. Their telephone number is 614-785-7266, email is scottoasis@ameritech.net. Please call and confirm pricing and availability before placing your order. Reunion Specific Information: You may pre-purchase your apparel and pick it up at the Friday rehearsal. Apparel will NOT be available for pick-up on Saturday game day. Oasis Embroidery will also be selling apparel at the Friday rehearsal. Certain sizes and styles may not be available on Friday, based on demand.